If your kitchen is past due for a makeover or you are in the planning stages of redesigning it, break down the project step by step to ensure that you get the most out of your new kitchen. Add function, style and flair to the heart of your home with one or all of our best tips for updating your kitchen. 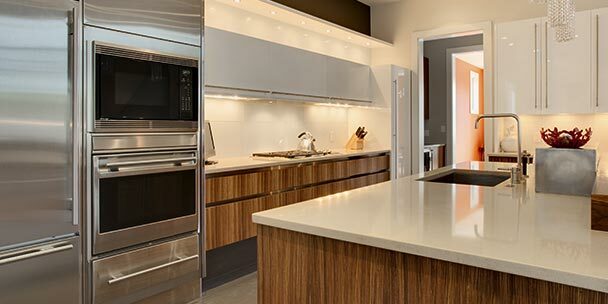 By having a solid plan for your kitchen remodel, you can help the process go as smoothly as possible, which will save you time and money in the long run. While you are designing, also keep in might your decorating ideas to ensure that everything will come together and make a cohesive design. Below are 20 tips to help guide you through your kitchen remodeling project. Before you begin remodeling your kitchen, determine how and where you will use your kitchen items. For instance, store breakfast bowls and food near the breakfast table. Keep plastic containers and wraps in a handy place near your work surface for wrapping leftovers. Locate flatware and dishes near the dishwasher to ease the process of unloading. By having a good understanding of how you want your kitchen items to be organized around your larger appliances, you can better plan for the type of storage you will need. For example, your silverware will likely go in a drawer, while your bowls and plates will go in a cabinet. Your plans should include what types of storage will flank your appliances. Create paths throughout your kitchen that are at least 36 inches wide. Also, walkways in the cooking zone should be 42 inches wide for kitchens with one cook, and 48 inches wide for configuring the area for two cooks. When you are in the design/planning process, adjust peninsulas and kitchen islands accordingly. Be sure you account for your appliances. When your refrigerator doors or dishwasher is ajar, it can create a roadblock in your kitchen pathway. You can remedy this by either creating a path that is wide enough to travel through even when your appliance doors are open, or by designing a kitchen that has two easily maneuverable pathways. The best location and height for a microwave depends on the primary chef and the degree of kid-friendliness that you desire in your kitchen. For adults, the microwave should be roughly 15 inches above countertop level. For kids, you might consider a below-countertop setup for safety and suitability. Many kitchens today are set up with the microwave sitting above the stove top, but some designers allege that this is a trend that is on its way out. If you plan to install your microwave over the range, you might want to consider how this decision will affect your house resale value. Locating your microwave away from your stove can also make it easier for the two appliances to be used by two different cooks at the same time. 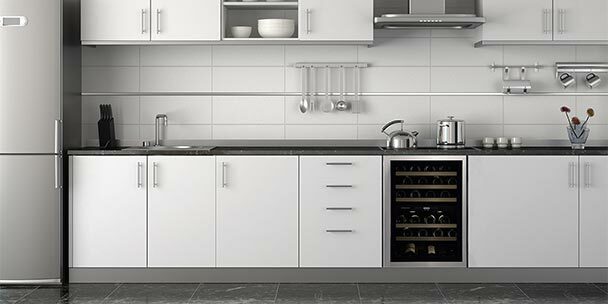 For appliance and cabinet doors to be fully functional, make sure you plan enough space for clearance and swing direction in your redesign. Keep appliances away from corners and ensure that doors do not bang into each other when opened at the same time. This is another time when having larger walkways might be a major problem solver in your kitchen. With the added room, you’ll be able to have multiple appliances open at once without them interfering with one another. When you plan a kitchen island, remember that form should follow function. If you want to eat and cook on kitchen islands, make sure you plan enough space to separate the cooktop safely from the dining area. You might also consider combining your kitchen island with your cutting board. This is a popular feature in many contemporary kitchens, but does come with certain drawbacks. Another unique design element people are incorporating in their new kitchens is having their island be a statement focal piece. They achieve this by using different materials on the island than they do for the other counters. For example, some people construct a butcher block kitchen island while keeping granite or nice laminate everywhere else. You can also experiment with cabinet colors and materials to make your island even more of statement piece. 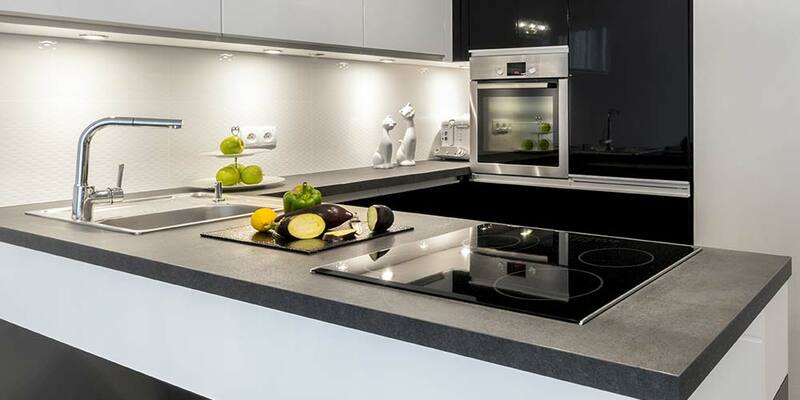 An ideal kitchen design allows at least 15 inches of countertop space on each side of a cooktop and refrigerator. This is referred to as a “landing space” and is especially useful when you are handling hot or heavy pots and pans. Landing areas are also important near the microwave. These are also great places for meal prep or ingredient organization. Consider how much space you should dedicate for counters. 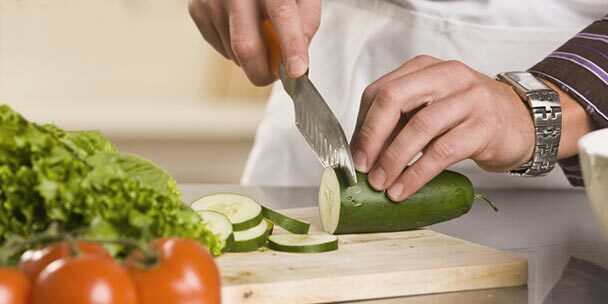 Those who frequently cook require more counter space than those who cook less often or who prepare simpler meals. Combining two different countertop heights eases the baking process and involves kids in preparing meals. Using two different heights can also help turn your counter into both a prep space and a dining area. Combining areas to save space is a great way to save money and add value to your house. A second microwave, refrigerator drawer or mini refrigerator placed at the edge of the kitchen work center keeps family members and guests out of the way of the chef. Having two of each appliance is also a desired element for people who wish to keep a kosher kitchen. Consider creating a space for your cooking utensils to hang while still being close to your range. This is a convenient addition to any kitchen that sees a lot of range use. A shelf behind or beside the range keeps utensils, cooking oils and spices handy. Use S-hooks near the range hood for hanging commonly used pots and pans. Just be sure that these items are hung out of the splash range around your stove top, or else expect to have to wash some grease spots off them every now and again. 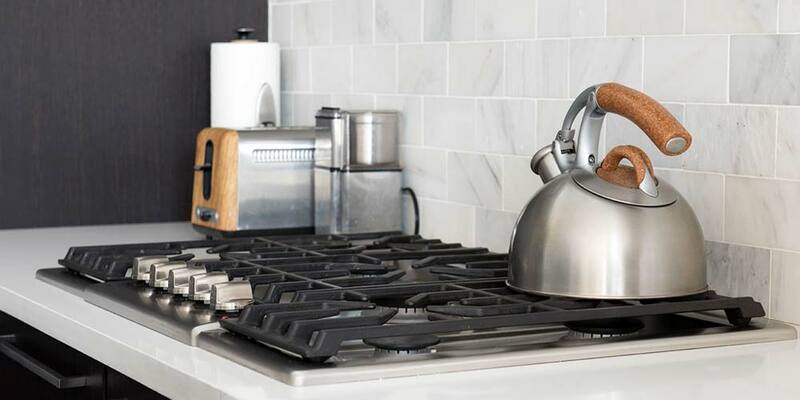 Installing a pot filler above your stove that swings out or has an extra-long hose on the faucet can help you avoid carrying heavy pots filled with water to the cooking area from the sink. Pot fillers enable you to fill containers directly on the cooking surface. Pot fillers are a desirable feature in many modern kitchens. Consider installing one not only for convenience, but to raise the value of your house once you decide to sell it. Design a place just for knives. Having an organized knife storage makes it easy to locate the best knife for a job and keeps dangerous items out of the reach of children. A knife drawer has specially designed slots for holding them in place and protecting sharp blades. If you do have young kids running around the house, consider installing child locks on any drawers that contain dangerous items. If you’re sick of having to take trip after trip to your garage recycling bin, or simply want to begin a greener lifestyle, consider making recycling an easy task by designing a feature in your kitchen specifically for it. 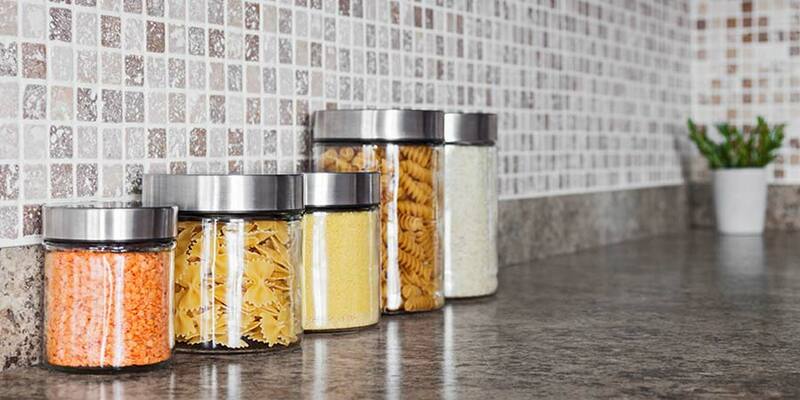 Try outfitting a cabinet with separate containers for glass, plastic and metal. A spare drawer can hold all of your old newspapers. This tip will help encourage you to maintain a green lifestyle by making recycling easy. It is important to set up your organization depending on everyone’s needs. For example, put your child’s favorite snack foods on shelves or in drawers that are within reach. 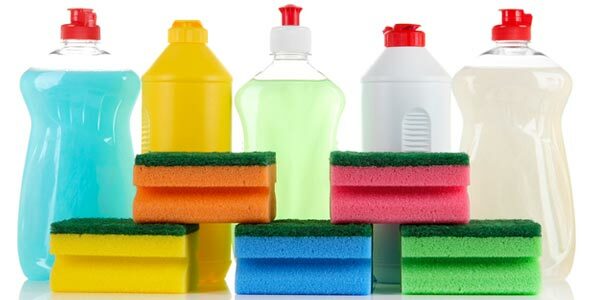 If you have very young kids running around, you may want to design your new kitchen so more dangerous items, such as alcohol, cleaning products and sharp objects are all stored high above their reach. Consider your cooking habits when deciding on your organization. If you know that you’ll be using certain pots and pans often, try to place your pot and pan storage near the stove top. Another fun idea for your new kitchen is to create an area where all reminders and messages are written. It might be a good idea to organize a message center near the kitchen telephone. Put a chalkboard, bulletin board or whiteboard on the wall, and store a notebook, calendar and writing utensils in a nearby drawer. 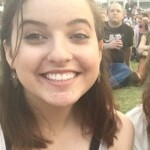 Feel free to get creative with your message center! This can be a quirky element to your kitchen, or you can remain traditional and refined with it. This is also a fun project to work on with your children. Dark color schemes shrink an already small space and make it less inviting. Use soft shades on kitchen cabinets and natural light to visually expand the room. Another trick to make a small kitchen feel larger is by keeping window curtains pulled back so as much light as possible streams in. If this isn’t a viable option for you, consider using softer light bulbs in your overhead lighting and having a mirror or two reflect this light around the room. If done properly, your carefully designed kitchen can significantly cut your cleanup time. By picking the right finishes and arranging things the right way, you can avoid spending too much time cleaning up messes. Think about installing shelving that are easy to clean. Spills can drip through wire shelves while glass shelves simplify the cleanup process. Matte finishes on faucets do not show dirt as much as the glossy ones. 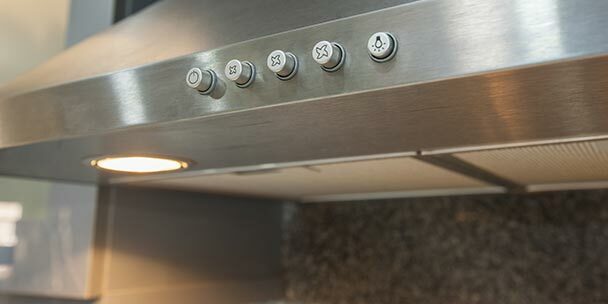 Stainless steel finishes are beautiful and a highly desired element in new kitchens, but make sure you are willing to maintain their appearance. Avoid bulky, bland blocks of drawers and doors by adding interesting details, such as display shelving and glass doors. 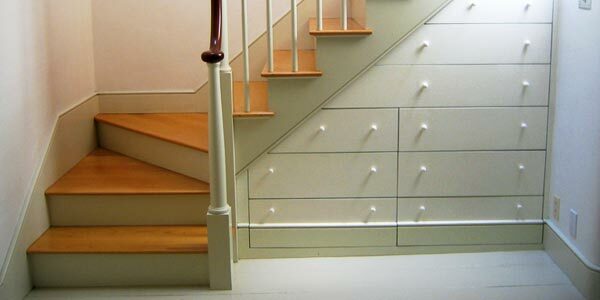 You can do this by investing in cabinetry that has nice details or custom pulls. You might also want to try windows or wine storage options. Today, everything is digital. Why not accommodate for this in your brand new kitchen by installing a charging station? Consider installing multiple outlets and USB charging stations on your kitchen walls and on the island so you will have electricity and charging stations wherever you need them. For kid-friendly designs, keep the cooktop out of the traffic areas so that children do not catch pan handles and cause spills when running through the kitchen. Try to make the refrigerator easily accessible not only to people cooking in the kitchen, but also to those doing cleanup or just looking for a snack. Again, seriously consider installing child locks on kitchen cabinets and drawers that contain anything that could be hazardous to both children and pets. Child locks are a cheap addition to any kitchen. They are also very easy to uninstall once you no longer need them, which is good news for your house’s resale value. A colorful backsplash, sizeable range hoods, fancy floors, bright kitchen cabinets and busy countertop patterns are all fun and beautiful on their own, but together they give the eye a bit too much to see. Instead of going bold with all of your kitchen elements, try picking a spot in your kitchen design to make your focal point and complement that area with a few soft and eye-pleasing details in other areas of your kitchen. A secret of a beautiful interior design: less is more. Renovations to your kitchen significantly increase the value of your home. 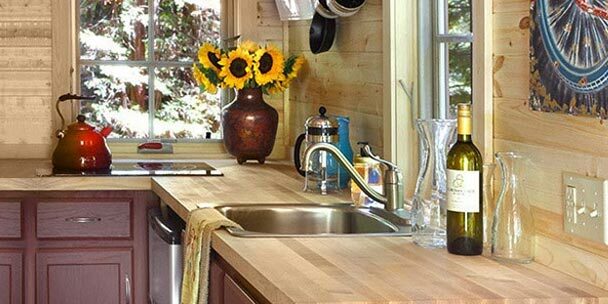 Plan on spending about 25 percent of the current value of your home for redesigning your kitchen. Start by having a solid plan about how you will be using your kitchen and what you will need on a daily basis. Finally, it is important to realize that a kitchen renovation can take weeks or even months to complete. You will likely need to involve designers, a general contractor, plumbers and architects. This way you can make your kitchen unique with creative and inspirational designs, while still remaining safe and up-to-code. Wonderful article. We are looking to start our renovation and this gave us some great tips and ideas. Well written article with some simple ideas that usually get overlooked. As for spending 25% of the home’s value on the kitchen remodel may seem a bit high and doesn’t apply to all homes. Cooktop vs Range: Which One Is Best For You?